Adrian Peterson is the NFL's second leading rusher with 1,221 yards this season. 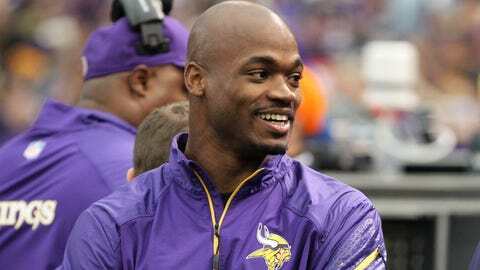 EDEN PRAIRIE, Minn. — After returning to practice on a limited basis Wednesday, Minnesota Vikings running back Adrian Peterson was held out Thursday to work with the team’s athletic training staff. Peterson, who missed last week’s game with a sprained foot, is expected to practice Friday and play in Sunday’s game at Cincinnati. "We’ll get him some work tomorrow, just thought it would be wise to give him a day inside with our training staff and just work through some of the kinks from yesterday’s practice," coach Leslie Frazier said Thursday. "Then hopefully we’ll get him back out here tomorrow." Peterson sprained his foot on Dec. 8 and practiced only one day last week before being declared inactive for Sunday’s 48-30 win against the Philadelphia Eagles. He’s also still bothered by a groin injury that Frazier said will likely be a concern the rest of the season. Frazier said he expects that Peterson "should be fine" and just wanted to stay cautious with the league’s second-leading rusher. "No real setbacks, just want to be smart with how we get him ready for Sunday," Frazier said. Tight end John Carlson also returned to practice on Wednesday for the first time since suffering a concussion on Dec. 8, but Carlson showed symptoms Thursday and had to be held out. Carlson will have to go through testing again to be cleared to return once more. "He’ll have some things he’ll have to clear to be able to come back out here tomorrow," Frazier said. Rookie cornerback Xavier Rhodes is still out with a sprained ankle. Frazier said Rhodes could still play on Sunday if he makes more progress and returns to practice on Friday. "Not enough where we could get him on the field at practice yet," Frazier said of Rhodes’ improvement. "Hopefully tomorrow he’ll be on the field. We obviously need him." Running back Matt Asiata was out with an ankle injury. Frazier was hopeful he could practice on Friday, too. Cornerback Chris Cook (knee), guard Brandon Fusco (knee), running back Toby Gerhart (hamstring) and safety Harrison Smith (toe) were limited Thursday. "Toby was fine today," Frazier said. "He feels like he’s strong and ready to go. So, barring any setbacks tomorrow, he should be ready to go." Smith will likely return to his starting spot at safety after coming off the bench in last week’s return from injured reserve. Jamarca Sanford would start at the other safety spot. Defensive coordinator Alan Williams said Smith was "pretty sore" this week after playing 61 of the 69 defensive snaps in Sunday’s game. The workload in his first game back was higher than the coaches expected. "We thought we’d limit the amount of snaps he got because he was out for so long," Williams said. "He just continued to say, âCoach I’m feeling good, I’m feeling good.’ Probably too many, though, with the number of snaps he did get — (it) was in the 60 range, I think. Too many to come back; we have to watch that. Hopefully not get him that many this time, but still get him in the ball game and get him going." Tough one to pull in: Jared Allen and Brian Robison are tied for the team lead with nine sacks and have a friendly competition to finish as the team leader. Each player also has his own signature sack celebration, which might be turning into its own competition. Allen, long known for his calf-roping celebration, critiqued Robison’s fishing celebration, which he debuted this season. After a sack, Robison pretends to cast out a line, set the hook and reel in a fish. "A little long, a little long," Allen joked. "That part is the greatest, when he just sets that hook. That’s the greatest. He could just walk off after that. But it’s pretty funny. I get a kick out of it. I said he needs to start throwing it back. When he sets the hook he should just be like, âAh, I’m just throwing it back.’"
Give it a chance: Minnesota tried to catch Philadelphia off-guard in last week’s win when receiver Cordarrelle Patterson took a handoff on an end-around and looked to pass. Patterson joked he wanted to pass, but receiver Greg Jennings didn’t get open. Turns out it wasn’t the first time the play didn’t work. "He throws it pretty well," offensive coordinator Bill Musgrave said. "He missed every one of them in practice last week, so we were thinking that was going to be a good omen for game day. But he didn’t get it launched." Patterson didn’t have an open receiver and he tucked the ball back down, reversed field and ended up running for a first down, going 12 yards after a block by quarterback Matt Cassel. If it didn’t work in practice, why call it in a game? "Well, just got to take a chance at times," Musgrave said. When asked if the chance needs to come even when Patterson has missed it, Musgrave said, "Yeah, evidently."